Four U.S. soldiers were killed and three wounded in a blast on Wednesday in the Syrian town of Manbij, a U.S. official said. Previously, a source told Turkey's TRT World, "The explosion took place inside a restaurant where US, French troops, and YPG militants were meeting." However, US defense officials have not immediately confirmed details, only saying in the aftermath that US coalition forces had been "conducting a routine patrol" in the area. White House correspondents have reported President Trump has been briefed on the matter. 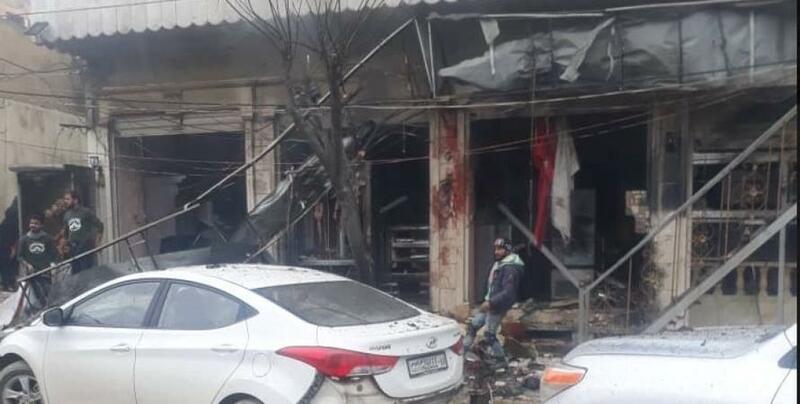 In an apparent terror attack targeting a US-led coalition patrol, a blast has rocked a restaurant in the northern Syrian city of Manbij on Wednesday. Conflicting reports say there are casualties among American soldiers as well as potentially a delegation of Syrian Kurdish leaders, as the bombing took place the moment a US military patrol passed by, and there may have even been coalition personnel inside the restaurant. Scene of the attack in Manbij, northern Syria, according to local sources. “Six civilians were killed and 19 others wounded as a result of an explosion in the center of the city of Manbij, while a US military patrol was passing,” an Al-Jazeera broadcast said. And a YPG-associated Manbij news organization, reporting from the ground, says that two US soldiers have died with 2 others evacuated to a hospital by military helicopter. Though unconfirmed, Al Jazeera in its early live broadcast has put the death toll at up to nine killed in the attack. A military helicopter was filmed landing near the scene to rescue survivors, which occurred just as American forces were reportedly making preparations to exit Syrian soil. Less than two hours later, the UK-based Syrian Observatory for Human Rights said the death toll has been raised to 14 people." The restaurant may have been a meeting place for a delegation of US and French soldiers and local Kurdish leaders. A source told Turkey's TRT World, "The explosion took place inside a restaurant where US, French troops, and YPG militants were meeting." An Islamic State-affiliated web site, Amaq, said an attacker with an explosive vest had struck a foreign military patrol in a suicide attack. Reuters could not independently verify a report by the UK-based Syrian Observatory for Human Rights that 14 people had been killed in the attack including two U.S. soldiers. The coalition could not be immediately reached for comment. Manbij has been held by US-backed Kurdish forces since the YPG Kurdish militia took it back from ISIS in 2016. It has for the past two years seen a significant US troop, special forces, and patrol presence, and has at least one known small American base. Meanwhile, the blast scene has barely yet to be evacuated, and the finger pointing begins on Trump's Syria pullout.